The West Chester University Golden Rams field hockey team picked up their biggest win of the season against No. 1 ranked Millersville on Wednesday, and then closed out the week with a shutout against Bloomsburg on Saturday to improve their winning streak to five games. The Golden Rams hosted Millersville on a rainy Wednesday afternoon for a premiere matchup between the No. 1 and No. 2 teams in the nation. Dayle Paustian scored the lone goal of the first half in the 31st minute on a penalty stroke to give West Chester the 1-0 heading into halftime. The first half was a great showing of the defense of these two powerhouses, with West Chester holding a 5-3 advantage in shots. Rachel Dickinson put Millersville on the board in the 41st minute with a penalty stroke goal of her own to knot the game up at 1-1. The rest of the half featured a defensive stalemate from the two squads and overtime would be needed yet again to settle this one. In the eighth minute of overtime, West Chester was awarded back-to-back penalty corners, and on the second attempt, Paustian fired a blast just inside the circle that deflected off the stick of Hannah Davies and sailed into the upper left corner of the net to give the Golden Rams the 2-1 victory. Sarah Krause picked up her sixth win in the cage, making one save in the effort. The win put an end to a five-game losing streak to Millersville, with their last win coming from the 2012 PSAC Championship game. The win also put the Golden Rams in a good position to win the regular-season conference title, and moved the team into the No. 1 slot in the PSAC rankings, moving ahead of Millersville. The Golden Rams hosted Bloomsburg University on Saturday to close out the week. The freshman superstar Rachal Toppi opened the scoring in the 12th minute with her 15th goal of the season, deflecting a blast from Kristina Sherrer into the back of the net to give the Rams the 1-0 lead. 13 minutes later, Toppi found the back of the net yet again for her 16th of her freshman season to give West Chester the 2-0 lead. The rest of the game featured no scoring despite West Chester holding a 21-4 advantage in shots, and a 21-3 advantage in penalty corners. Bloomsburg’s goalie Lindsay Cassel made 13 saves in the losing effort, and Kruase picked up her seventh win of the season in the shutout, her fourth of the season. The win put the winning streak for West Chester to five, and gives them an overall record of 12-2. Since taking over goalkeeping duties for the Golden Rams in the fourth game of the season, Krause has played incredibly well in the cage for the team. “Sarah has been doing a solid job in the goal for us. She’s had a few shutouts and some incredible saves thus far. Our defense had really come together around her which is another reason for the shutouts. Our back five plus our keeper really take pride in their defensive work each day and definitely on game day,” Coach Cohen stated. 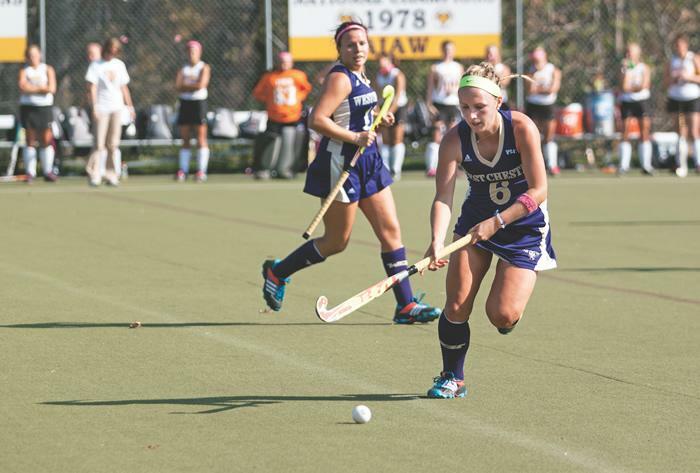 Alexis Versak has sprouted as an MVP canidate in all of D-II field hockey. She has been a leader for the Rams all season, and certainly and asset to their consistent success. Currently, Versak has eight goals and 18 points on the year, but her consistent hard work and effort put out on and off the field has brought the recent recognition. West Chester looks to add to their winning streak with a pair of PSAC matchups this week. They will travel to Kutztown University for a night game, and close out the week at home on Saturday against Mansfield University. Kutztown enters the upcoming matchup with our Golden Rams, coming off a win against Mansfield, 5-2. As of now, Kutztown sits at 7-7 with a 5-5 conference record. Although their record may not look as strong as West Chester’s, Kutztown is not a team to go lightly on. The upcoming two games are huge in WCU’s season. With just four regular season games remaining for the Lady Rams, the playoffs are right around the corner. If the Rams can stay solid, as they have all season, through these next four games, they can also secure a first round bye. If secured, the Rams will be lucky enough to walk right into the PSAC semifinals without even playing a game. Another big aspect of securing the top seed is home-field advantage. Home-field advantage is a huge factor for any team, but West Chester would be at an extreme advantage. The Golden Rams play on astro turf, much different then almost all PSAC teams, who play on the much more common neXturf. Despite just facing off with Millersville this week, the Lady Rams will certainly be getting used to the Marauders faces. It is almost guaranteed that the two will face off in PSAC playoffs. Also, their is a very high chance of them facing off in the D-II tournament as well. The PSAC dominates the D-II national rankings when it comes to field hockey, so it is very common for two PSAC teams to meet in a national semi-final game or a national championship. With the way these two teams are playing, the possibility is strong.